Nifty opened positive but had a very dull day of trade with a spread of just 21 points and one of the lowest volume of recent times. The index after a toil ended the day at 5905.10, a miniscule loss of 3.25 points. The broader market performed much better, with 859 advances to 654 declines. The OI Table saw fortification around 5800PE and 6000CE. Call option 5900-6300 added 24.18 lacs huge amount of OI. Put Option 6000-5400 added 27.52 lacs huge amount of OI. 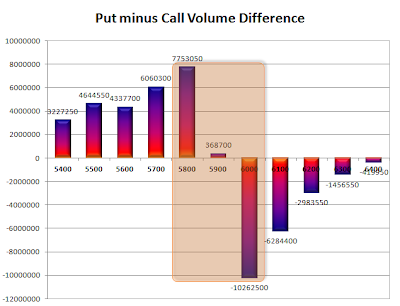 Highest accumulation on Call option 6000 at 55.1 lacs & 6100 at 43.5 lacs whereas Put option 5800 at 52.4 lacs & 5700 at 49.4 lacs. Nifty Open Interest is at 1,63,73,150 up by 41,050, with small decrease in price, most probably small short build-up. 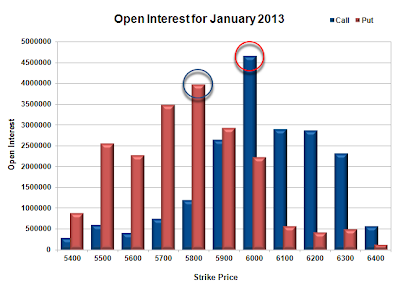 Bank Nifty Open Interest is at 10,24,850 up by 10,750, with small increase in price, most probably long build-up. FII’s sold huge 4.11 lacs of Futures, most probably long liquidation, as their net OI decreased by 6665 contract and the average price per contract comes to around 5965. FII’s future open contract as on date is 256817. 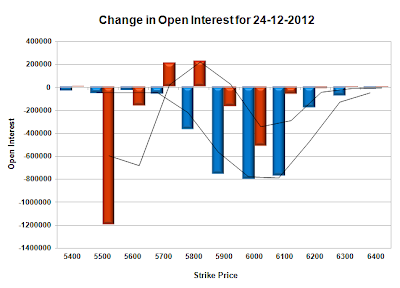 PCR Open Interest (Volume) is hovering above 1.2 and now at 1.257. Initial support now up at 5900PE with OI above 39.3 lacs and below that at 5800 with OI of 52.4 lacs. 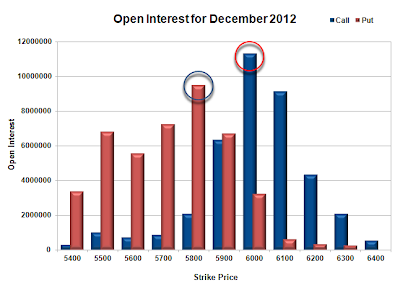 The Best Resistance at 6000CE, with OI above 55.1 lacs, and above that at 6100 with OI of 43.5 lacs. Range as per Option Table is 5865 -5948 and as per VIX is 5859 - 5951 with 5905 as the Pivot. Nifty opened positive just above 5900, but turned weak to touch the lows of 5880. The responsive buyers took control from the lows to end the day at the peak of 5908.35, a solid gain of 38.25 points. On a week-on-week basis the index gained 60.65 points or about 1.04%. The broader market was also positive, with 786 advances to 706 declines. The OI Table saw the PE writers in control of the proceedings with huge addition of 79.5 lacs and base building around 5800 level. 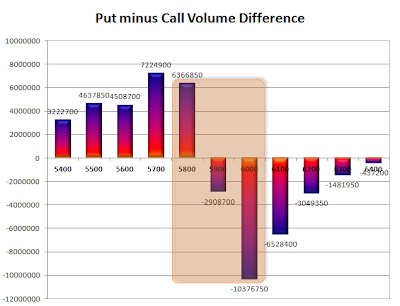 Call option 5900-6400 added 26.25 lacs huge amount of OI with some short covering seen at 5800 level. Put Option 6000-5400 added 66.51 lacs huge amount of OI. Highest accumulation on Call option 6000 at 50.3 lacs & 6100 at 37.5 lacs whereas Put option 5800 at 47.8 lacs & 5700 at 44.3 lacs. Nifty Open Interest is at 1,63,32,100 down by 1,33,450, with increase in price, most probably short covering. Bank Nifty Open Interest is at 10,14,100 up by 11,950, with small decrease in price, most probably short build-up. FII’s bought huge 3.75 lacs of Futures, most probably short covering, as their net OI decreased by 1804 contract and the average price per contract comes to around 5969. FII’s future open contract as on date is 263482. 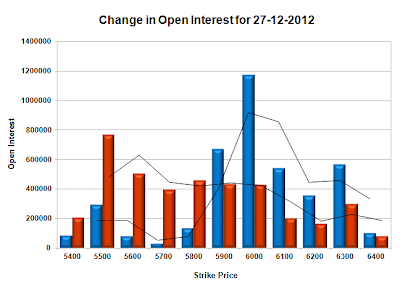 PCR Open Interest (Volume) has inched up to 1.259. 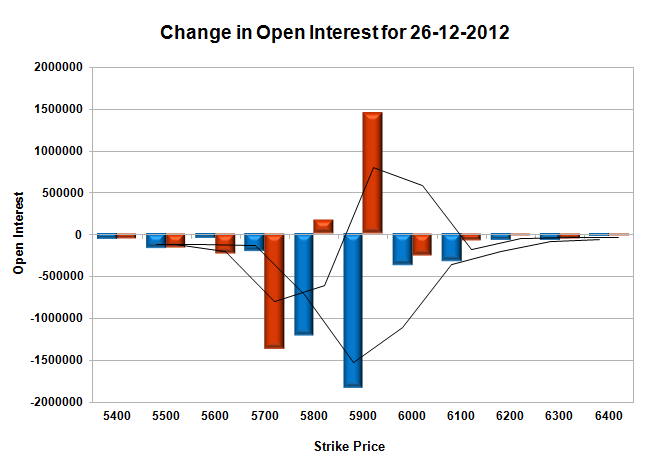 Initial support now up at 5900PE with OI above 37 lacs and below that at 5800 with OI of 47.8 lacs. 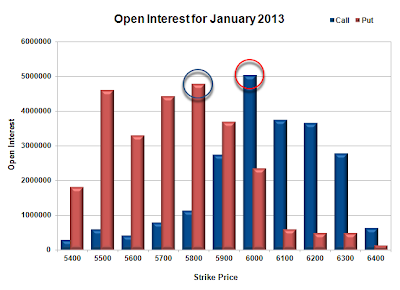 Best Resistance at 6000CE, with OI above 50.3 lacs, and above that at 6100 with OI of 37.5 lacs. 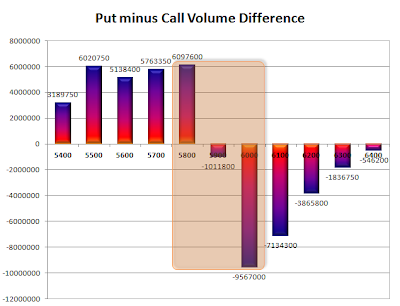 Range as per Option Table is 5861 -5948 and as per VIX is 5866 - 5951 with 5905 as the Pivot. Nifty opened positive, but was sold off from the word go with the intensity increasing with each passing hour. The Bulls lost all in the last half hour to close below the psychological level of 5900 and around the lows of the day at 5870.10 a loss of 35.50 points. The broader market was also weak, with 526 advances to 969 declines. 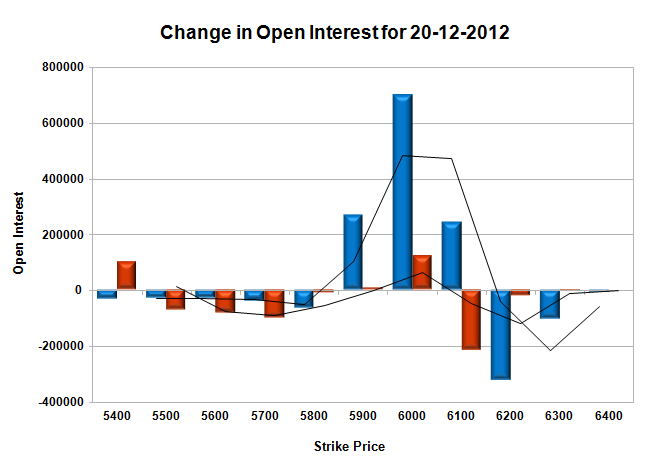 The OI Table at the start of the new series looks like in a range of 5700-6100 for the time being. 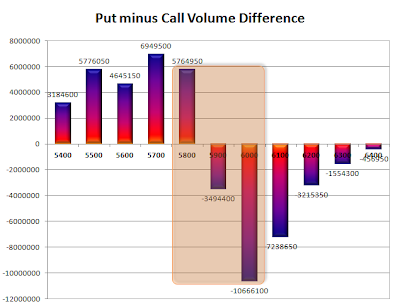 Call option 5800-6400 added 35.30 lacs huge amount of OI with some addition seen at 5500 level also. Put Option 6300-5400 added 38.27 lacs huge amount of OI. 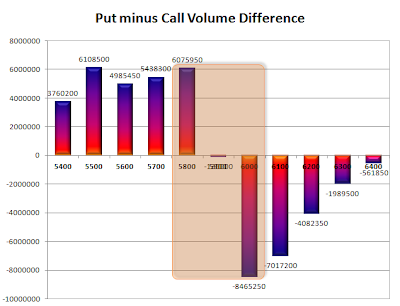 Highest accumulation on Call option 6000 at 46.6 lacs & 6100 at 29 lacs whereas Put option 5800 at 39.7 lacs & 5700 at 34.7 lacs. 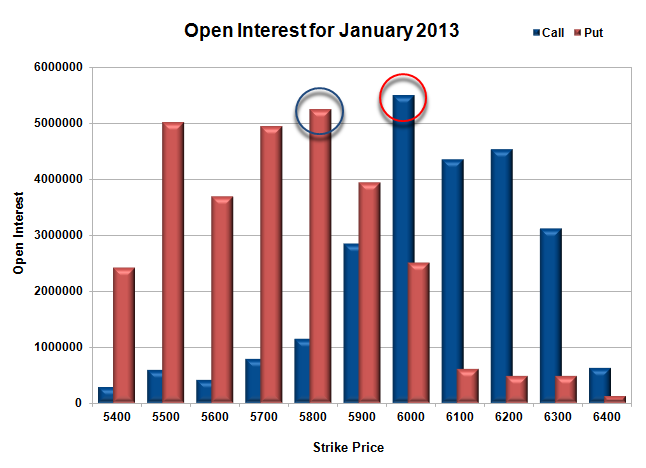 Nifty Open Interest is at 1,64,65,550 up by 29,45,600, with decrease in price, most probably short build-up. Bank Nifty Open Interest is at 10,02,150 up by huge 3,38,675, with small decrease in price, most probably long/short build-up. FII’s sold huge 7.57 lacs of Futures, most probably short build-up, and the average price per contract comes to around 5948. FII’s future open contract as on date is 265286. PCR Open Interest (Volume) at start of series is just above 1 at 1.050. 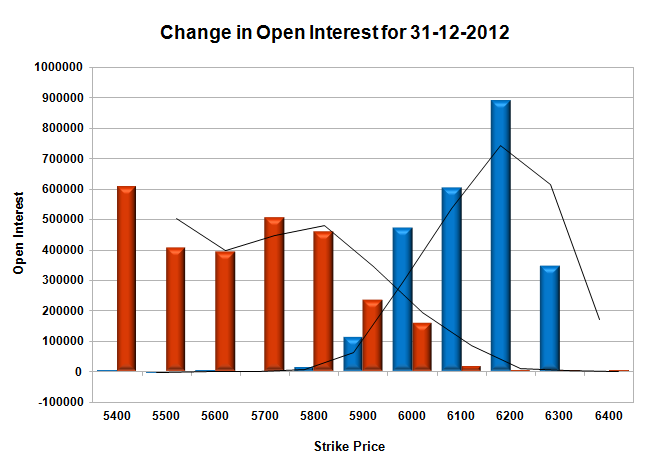 Support building up at 5800PE with OI now above 39.7 lacs and below that at 5700 with OI of 34.7 lacs. 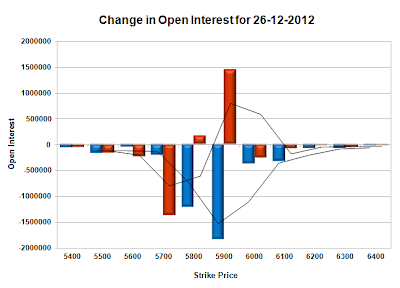 Resistance at 6000CE, with OI above 46.6 lacs, and above that at 6100 with OI of 28.9 lacs. 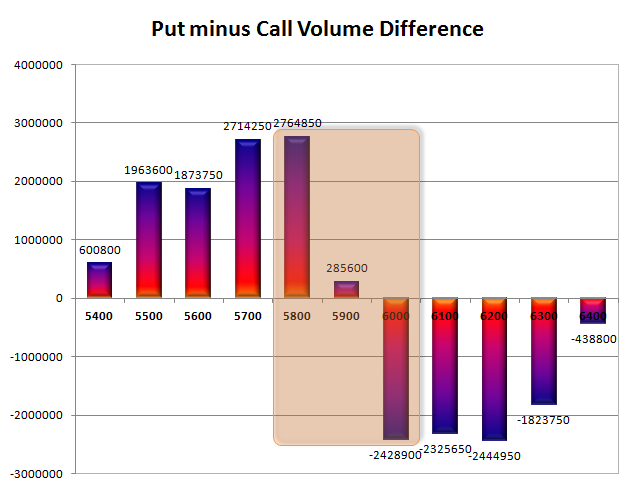 Range as per Option Table is 5842 -5927 and as per VIX is 5828 - 5912 with 5880 as the Pivot. The Bulls came back when it mattered most, Nifty after opening flat gained momentum after the initial hours of trade to scale 5900 with ease and closed at 5905.60, a good gain of 49.85 points. The best part was huge addition to the tune of 32 lacs in Jan series. The broader market also performed well, with 819 advances to 679 declines. The OI Table saw huge liquidation at 5800-6100CE levels. Call option 5900 and above saw huge profit booking with some short covering below 5800 was also seen. Put Option 5900-5800 added 16.15 lacs huge amount of OI with huge profit booking seen at 5700 and below strike prices. Highest accumulation on Call option 6000 at 1.13 crore & 6100 at 65.1 lacs whereas Put option 5800 at 92.3 lacs & 5700 at 65.6 lacs. Nifty Open Interest is at 1,21,99,100 down by 8,16,700, with addition of huge 31.67 lacs in Jan series 100% rollover with huge long build-up in next series. Bank Nifty Open Interest is at 7,32,000 down by huge 1,75,625, with addition of 3.05 lacs in Jan series 100% rollover with huge long build-up in next series. FII’s bought 2.88 lacs of Futures, most probably long build-up as their OI also increased by 77028 contracts, and the average price per contract comes to around 5874. FII’s future open contract as on date is 560331. 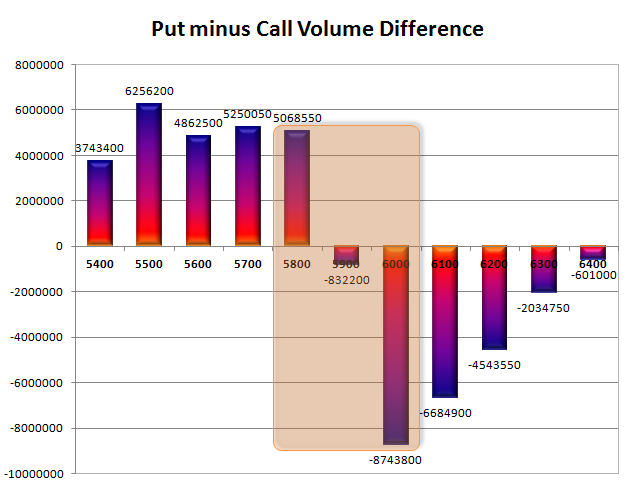 PCR Open Interest (Volume) has jumped to 1.379 due to huge liquidation seen at each and every CE levels. The best support at 5800PE with OI now above 92.2 lacs and below that at 5700 with OI of 65.6 lacs. 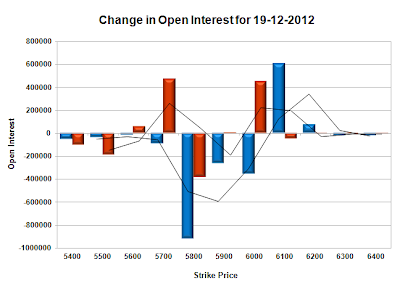 Huge resistance at 6000CE, with OI above 1.13 crore, and above that at 6100 with OI of 65.1 lacs. Range as per Option Table is 5856 -5941 and as per VIX is 5862 - 5949 with 5900 as the Pivot. Nifty opened gap-up and stayed above the previous day’s close for almost the entire session of trade and closed just above at 5855.75 a smallish gain of 8.05 points. It was a dull day of trade within a spread of 27 points and very low volumes. The broader market was just flat to negative, with 737 advances to 768 declines. The OI Table saw huge liquidation at 5800-6100CE levels. 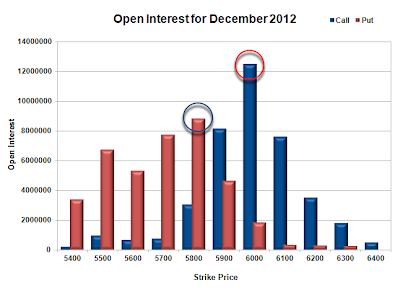 Put Option 5800-5700 added 4.41 lacs huge amount of OI with huge short covering seen at 5900 and above strike prices. Highest accumulation on Call option 6000 at 1.17 crore & 5900 at 74.0 lacs whereas Put option 5800 at 90.6 lacs & 5700 at 79.3 lacs. Nifty Open Interest is at 1,30,15,800 down by 25,70,200, with addition of 28.48 lacs in Jan series mostly rollover with small long build-up in next series. Bank Nifty Open Interest is at 9,07,625 down by huge 1,17,200, with addition of 82,100 in Jan series mostly rollover with huge long liquidation. FII’s bought 2.78 lacs of Futures, most probably long build-up as their OI also increased by 25987 contracts, and the average price per contract comes to around 5822. FII’s future open contract as on date is 483303. 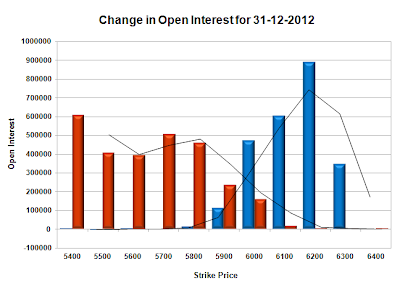 PCR Open Interest (Volume) is back above 1.2 and now at 1.232 due to huge liquidation seen at each and every CE levels. 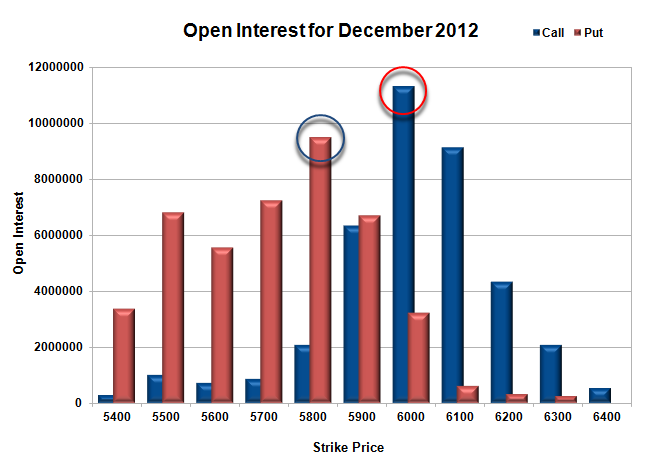 The best support at 5800PE is getting better with OI now above 90.6 lacs and below that at 5700 with OI of 79.3 lacs. 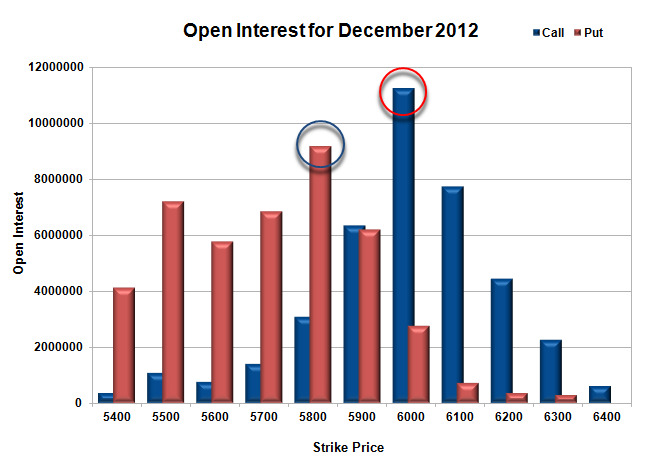 Initial resistance is still at 5900CE, with OI above 74.0 lacs, and above that at 6000 with highest OI of 1.17 crore. Range as per Option Table is 5815 -5900 and as per VIX is 5811 - 5900 with 5880 as the Pivot. Nifty opened gap-down below 5900 and saw huge sell-off with the buyers nowhere to be seen. The index touched the low of 5840 and closed at 5847.70, a loss of huge 68.70 points, the biggest one day sell in recent times. On a week on week basis the index declined by 31.90 points or about 0.54% points. The broader market was also very weak, with 357 advances to 1167 declines. 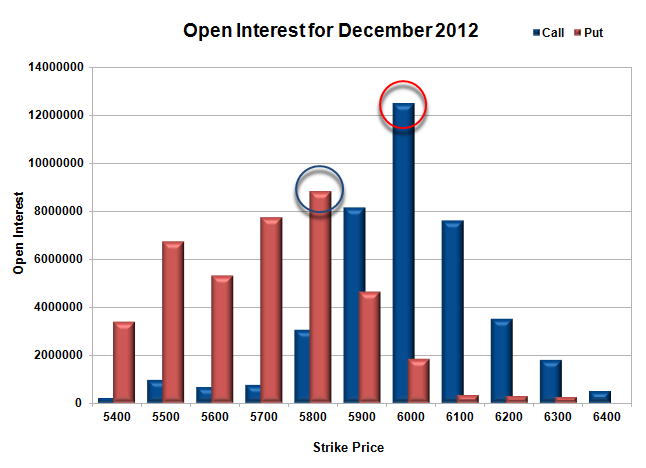 The OI Table saw huge addition at 5900CE level, which now will act as resistance to any up-move for the time being. Call option 5800-6000 added 30.47 lacs huge amount of OI with huge profit booking seen at 6100 and above strike prices. Put Option 5700 added 5.86 lacs huge amount of OI with huge short covering seen at 5800 and above strike prices. Highest accumulation on Call option 6000 at 1.25 crore & 5900 at 81.6 lacs whereas Put option 5800 at 88.3 lacs & 5700 at 77.2 lacs. Nifty Open Interest is at 1,55,86,000 down by 40,55,700, with addition of 43.15 lacs in Jan series mostly rollover with some short build-up in next series. Bank Nifty Open Interest is at 10,24,825 down by huge 87,600, with addition of 43,250 in Jan series mostly rollover with huge long liquidation. FII’s sold 2.36 lacs of Futures, most probably short build-up as their OI also increased by 20990 contracts, and the average price per contract comes to around 5803. FII’s future open contract as on date is 457316. PCR Open Interest (Volume) crashed down to 1.172 due to huge liquidation at 5900-6000PE levels. 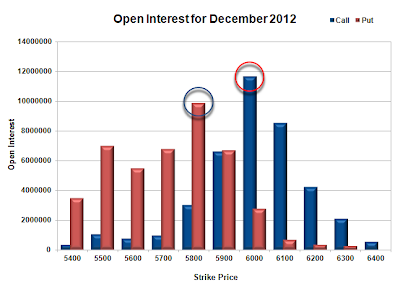 The best support is still at 5800PE with OI above 88.3 lacs and below that at 5700 with OI of 77.2 lacs. 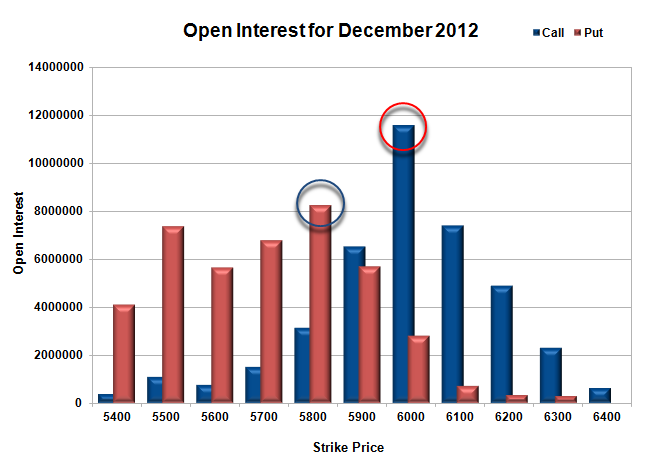 Initial resistance is now at 5900CE, with OI above 81.6 lacs, and above that at 6000 with highest OI of 1.25 crore. Range as per Option Table is 5813 -5900 and as per VIX is 5803 - 5892 with 5880 as the Pivot. Nifty saw a perfect consolidation day after the huge volatility that was seen yesterday. The index opened positive and remained range bound within a narrow range of 30 points to close the day with a good gain of 32.80 points at 5929.60. The broader market also was in good shape, with 869 advances to 645 declines. The OI Table saw huge liquidation at 5800-6000CE levels. 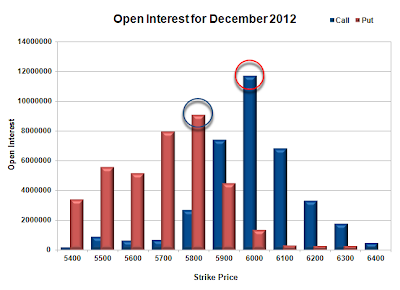 Call option 6100-6200 added 6.84 lacs huge amount of OI with huge short covering seen at 5900 and below strike prices. Put Option 6000, 5700-5600 added 9.78 lacs huge amount of OI with huge profit booking seen at 5800 and lower strike prices. Highest accumulation on Call option 6000 at 1.13 crore & 6100 at 91.5 lacs whereas Put option 5800 at 95.0 lacs & 5700 at 72.4 lacs. 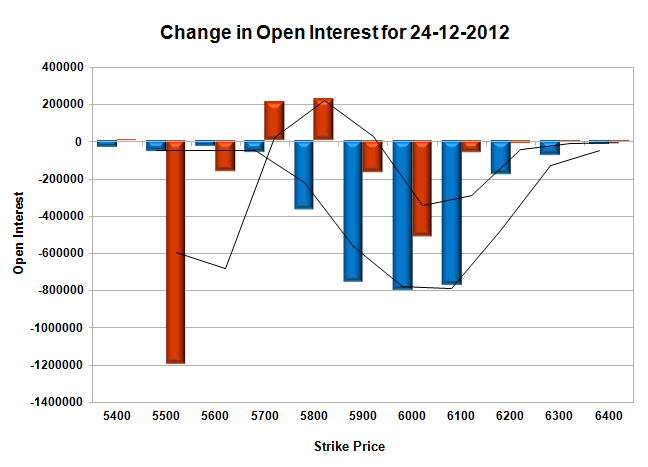 Nifty Open Interest is at 2,14,07,450 down by 2,64,700, with increase in price, most probably long liquidation. Bank Nifty Open Interest is at 11,70,725 down by huge 59,700, with small increase in price, most probably long liquidation. FII’s sold huge 2.79 lacs of Futures, most probably short build-up as their OI also increased by 5562 contracts, and the average price per contract comes to around 5879. FII’s future open contract as on date is 439343. PCR Open Interest (Volume) is moving up fast and now at 1.285, due. 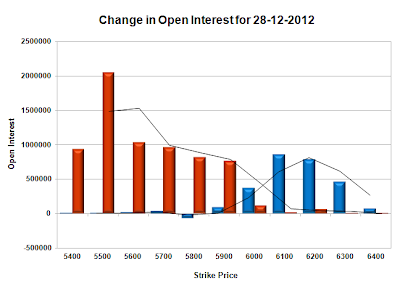 Initial support now moving up at 5900PE with OI of 66.9 lacs and below that at 5800 with highest OI of 95 lacs. Huge resistance still very much at 6000CE, though small liquidation was seen, with OI above 1.13 crore, and above that at 6100 with OI of 91.5 lacs. 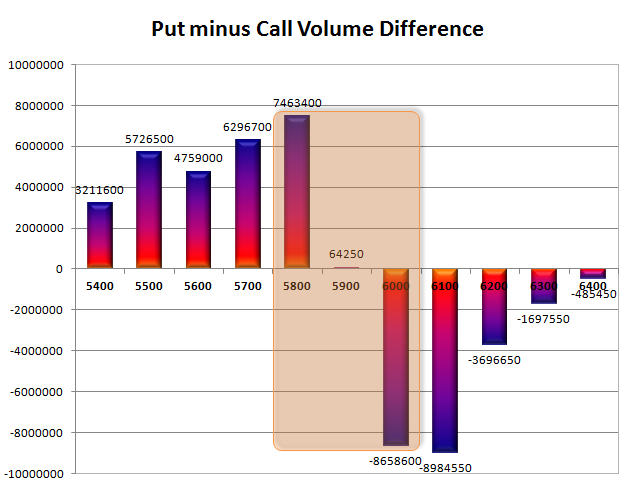 Range as per Option Table is 5883 -5970 and as per VIX is 5885 - 5975 with 5920 as the Pivot. Nifty opened positive and was bound within a narrow range till the RBI Governor came with a no change policy. The index nose-dived to lows of the day at 5823 but sanity prevailed and after huge bout of volatility, Nifty closed the day with a good gain of 38.90 points at 5896.80. The broader market performed well, with 869 advances to 637 declines. The OI Table saw huge addition 5900-5800PE level and now 5800 looks like a good base. Call option 6100-6200 added 7.25 lacs huge amount of OI with huge short covering seen at 5900 and below strike prices. Put Option 6000-5800 added 14.60 lacs huge amount of OI with huge profit booking seen at 5700 and lower strike prices. Highest accumulation on Call option 6000 at 1.17 crore & 6100 at 85.5 lacs whereas Put option 5800 at 98.9 lacs & 5500 at 69.9 lacs. Nifty Open Interest is at 2,16,72,150 up by 3,35,300, with increase in price, most probably long build-up. Bank Nifty Open Interest is at 12,30,425 down by huge 46,075, with small increase in price, most probably short covering. FII’s sold small 0.25 lacs of Futures, most probably short build-up as their OI also increased by 18570 contracts, and the average price per contract comes to around 5861. FII’s future open contract as on date is 433781. PCR Open Interest (Volume) is up to 1.244, due to huge liquidation seen at 6000CE and lower strike levels. Best Support at 5800PE, got better with OI now at 98.9 lacs and below that at 5700 with OI of 67.6 lacs. 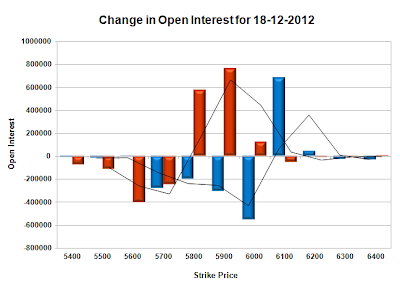 Huge resistance at 6000CE with OI above 1.17 crore, and above that at 6100 with OI of 85.5 lacs. Range as per Option Table is 5838 -5926 and as per VIX is 5852 - 5941 with 5890 as the Pivot. Nifty opened weak but covered up within the very first few minutes. Nifty was unable to stay above the previous day’s close level and had a slow and steady decline with each passing hour to the lows of the day at 5850, and closed just up at 5857.90 a small loss of 21.70 points. The broader market performed reasonably well, with 823 advances to 701 declines. The OI Table saw huge addition at 6000CE and now OI is above 1.22 Crore. Call option 5800-6100 added 18.33 lacs huge amount of OI with huge profit booking seen at 6200 and above strike prices. Put Option 5800-5600 added 4.43 lacs huge amount of OI with some short covering seen at 5900 and above strike prices. Highest accumulation on Call option 6000 at 1.22 crore & 6100 at 78.7 lacs whereas Put option 5800 at 93.1 lacs & 5500 at 71.1 lacs. Nifty Open Interest is at 2,13,36,850 down by 35,000, with decrease in price, most probably long liquidation. Bank Nifty Open Interest is at 12,76,500 down by huge 21,350, with small decrease in price, most probably long liquidation. FII’s bought huge 1.11 lacs of Futures, most probably short covering as their OI also decreased by 779 contracts, and the average price per contract comes to around 5819. FII’s future open contract as on date is 415211. 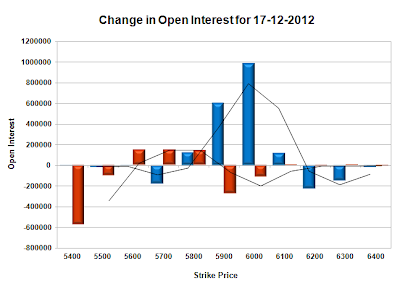 PCR Open Interest (Volume) is down to 1.212, due to huge addition seen at 6000CE level. Best Support still at 5800PE with OI above 93.1 lacs and below that at 5700 with OI of 70.1 lacs. 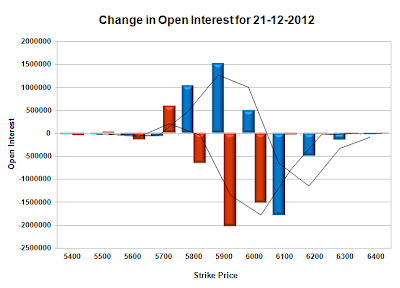 Huge resistance at 6000CE with OI above 1.22 crore, and above that at 6100 with OI of 78.7 lacs. 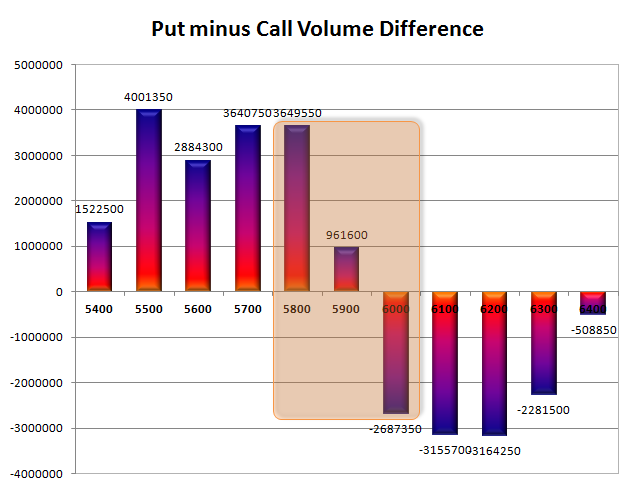 Range as per Option Table is 5821 -5905 and as per VIX is 5812 - 5904 with 5880 as the Pivot. Nifty opened flat and looked weak during initial hours of trade, but after inflation data came in at lower than expected 7.24%, the index recovered well enough to post reasonable gain of 28.10 points to close the day at 5879.60. On a week-on-week basis the index lost 27.80 points or around 0.47%. The broader market was a bit weak, with 720 advances to 777 declines. The OI Table saw 5800PE crossing 90 lacs and seems like the base till expiry. Call option 6100 added 3.20 lacs huge amount of OI with huge profit booking seen at 6000 and above strike prices. Put Option 5900-5600 added 16.44 lacs huge amount of OI with some profit booking seen at 5500 strike price. Highest accumulation on Call option 6000 at 1.12 crore & 6100 at 77.5 lacs whereas Put option 5800 at 91.7 lacs & 5500 at 72.1 lacs. Nifty Open Interest is at 2,13,71,850 down by huge 1,36,850, with increase in price, most probably short covering. Bank Nifty Open Interest is at 12,97,850 up by huge 39,525, with increase in price, most probably long build-up. FII’s sold huge 2.39 lacs of Futures, most probably short build-up as their OI also increased by 560 contracts, and the average price per contract comes to around 5843. FII’s future open contract as on date is 415990. 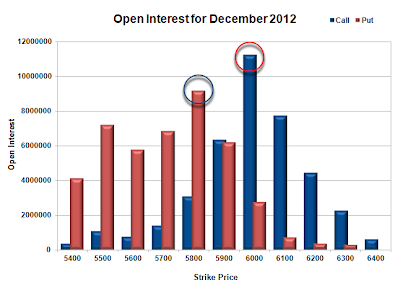 PCR Open Interest (Volume) has moved higher to 1.250 due to huge addition at 5800PE. 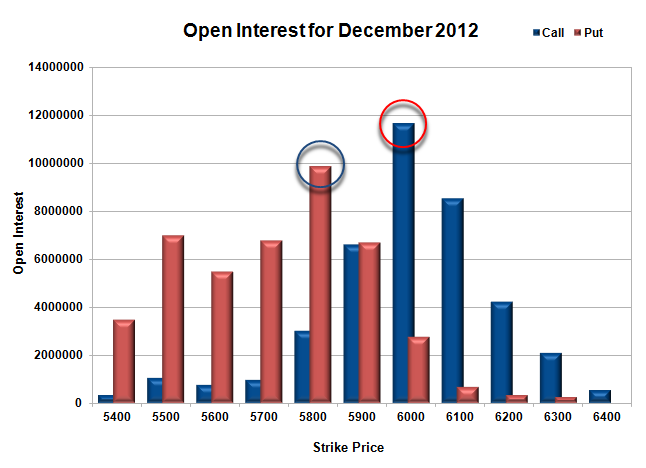 Super Support now at 5800PE with OI above 91.7 lacs and below that at 5700 with OI of 68.7 lacs. 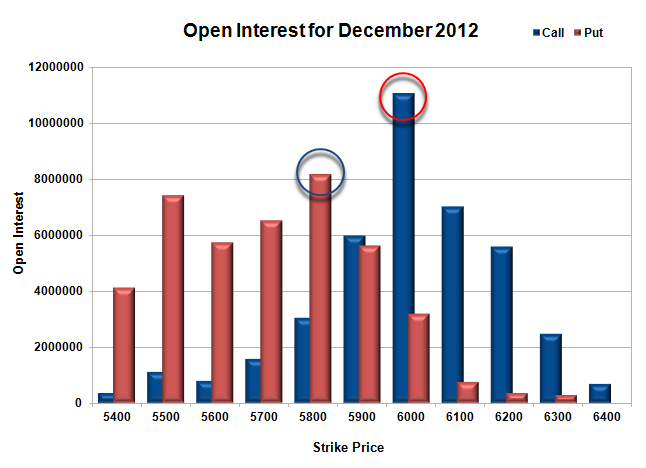 Tremendous resistance at 6000CE with OI above 1.12 crore, and above that at 6100 with OI of 77.5 lacs. Range as per Option Table is 5828 -5916 and as per VIX is 5836 - 5923 with 5890 as the Pivot. Nifty opened positive on the back of good global cues but was unable to sustain above 5900. What seemed like another range bound day in the making saw a huge sell-off in the second half to the lows of 5840 to close just above at 5851.50 a huge loss of 36.50 points. The broader market also performed badly, with 444 advances to 1097 declines. 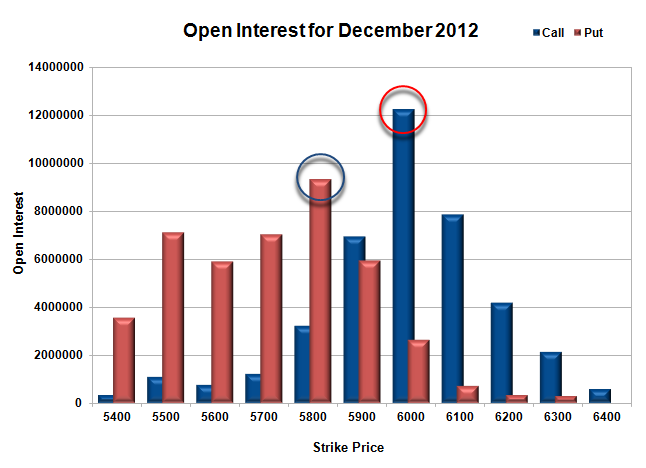 The OI Table saw 5900CE OI overtaking that of 5900PE by a fair margin. Call option 5800-6100 added 15.57 lacs huge amount of OI with huge profit booking seen at 6200 and above strike prices. 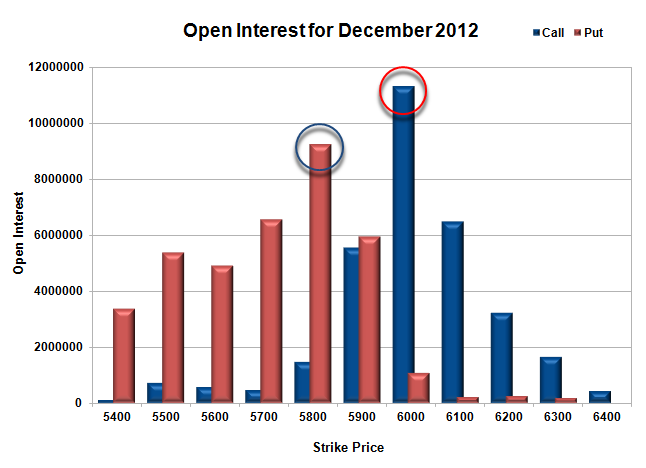 Put Option 5900-5700 added 3.74 lacs huge amount of OI with some short covering seen at 6000 and above strike prices. Highest accumulation on Call option 6000 at 1.16 crore & 6100 at 74.3 lacs whereas Put option 5800 at 82.3 lacs & 5500 at 73.7 lacs. 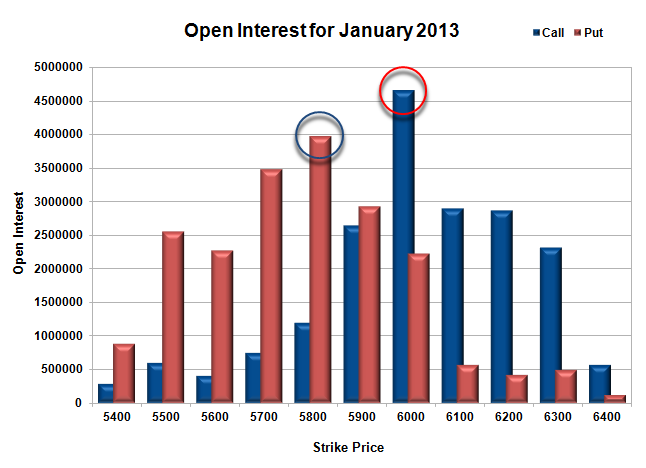 Nifty Open Interest is at 2,15,08,550 up by huge 3,80,800, with decrease in price, most probably short build-up. Bank Nifty Open Interest is at 12,58,325 down by 16,125, with decrease in price, most probably long liquidation. FII’s sold huge 5.91 lacs of Futures, most probably short build-up as their OI also increased by 8250 contracts, and the average price per contract comes to around 5803. FII’s future open contract as on date is 415430. 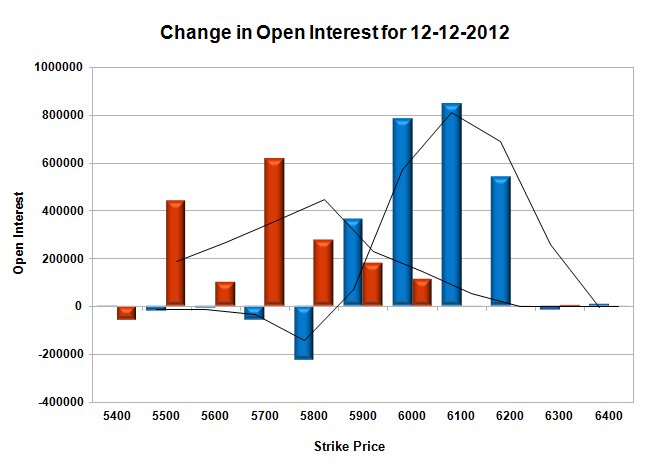 PCR Open Interest (Volume) is at 1.191, below the Bull level of 1.20. 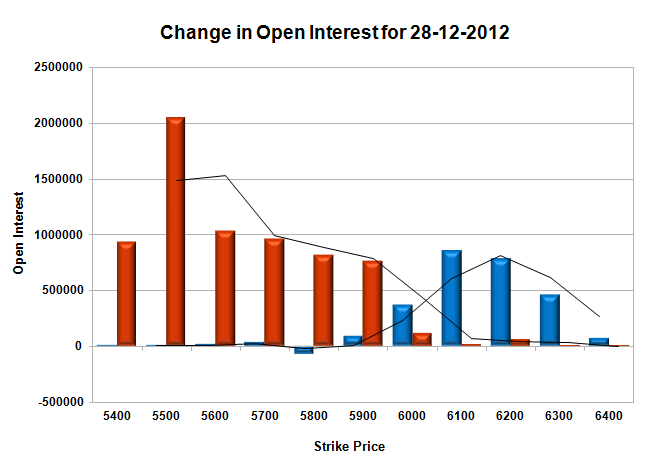 Best Support still at 5800PE with OI above 82.3 lacs and below that at 5700 with OI of 67.7 lacs. Super resistance at 6000CE with OI above 1.16 crore, and above that at 6100 with OI of 74.3 lacs. 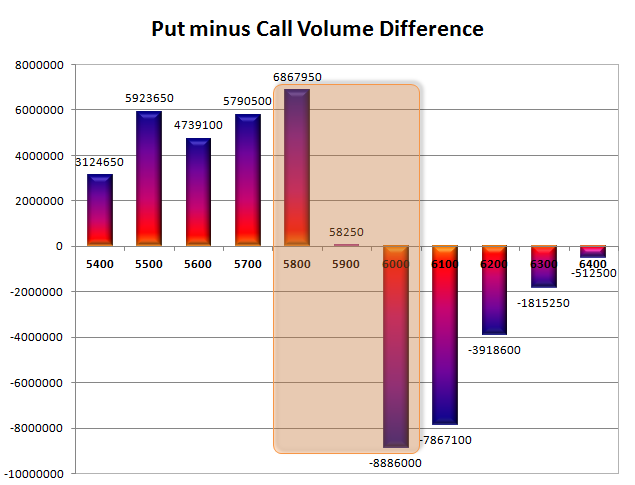 Range as per Option Table is 5819 -5906 and as per VIX is 5806 - 5897 with 5870 as the Pivot. Nifty had a inside day after the huge move of yesterday with the index opening positive but selling off instantly. A better than expected IIP growth at 8.2% compared to same month last year, saw the index move up smartly but was sold off again to close near the lows of the day at 5888, a small loss of 10.80 points. The broader market also performed badly, with 639 advances to 859 declines. The OI Table saw 6000CE OI at 1.1 crore for the first time in the series. Call option 5900-6200 added 25.30 lacs huge amount of OI with some short covering seen at 5800 and below strike prices. Put Option 6000-5500 added 17.25 lacs huge amount of OI with some profit booking seen at 5400 and below strike prices. Highest accumulation on Call option 6000 at 1.11 crore & 6100 at 70.3 lacs whereas Put option 5800 at 81.6 lacs & 5500 at 74.3 lacs. Nifty Open Interest is at 2,11,27,750 up by huge 7,89,600, with small decrease in price, most probably short build-up. 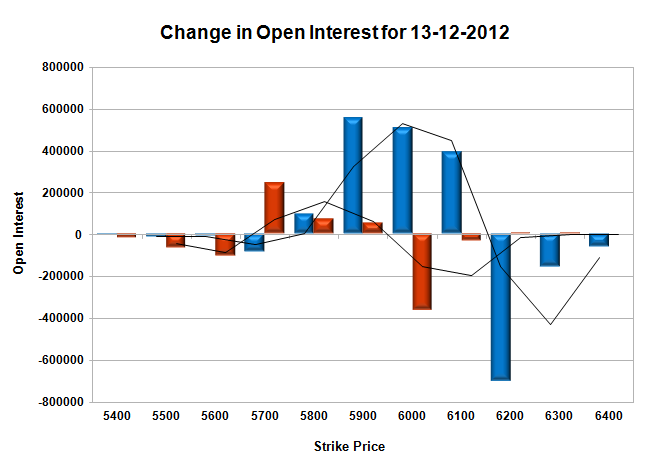 Bank Nifty Open Interest is at 12,74,450 down by 14,825, with decrease in price, most probably long liquidation. FII’s sold huge 1.3 lacs of Futures, most probably short build-up as their OI also increased by 15696 contracts, and the average price per contract comes to around 5852. FII’s future open contract as on date is 407180. 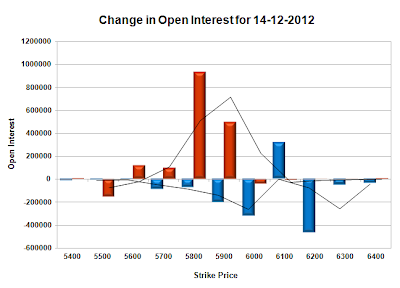 PCR Open Interest (Volume) again down, but still above the Bull level of 1.20 and now at 1.210. Super Support now at 5800PE with OI above 81.6 lacs and below that at 5700 with OI of 65.3 lacs. Wall of China at 6000CE with OI above 1.1 crore, and above that at 6100 with OI of 70.3 lacs. 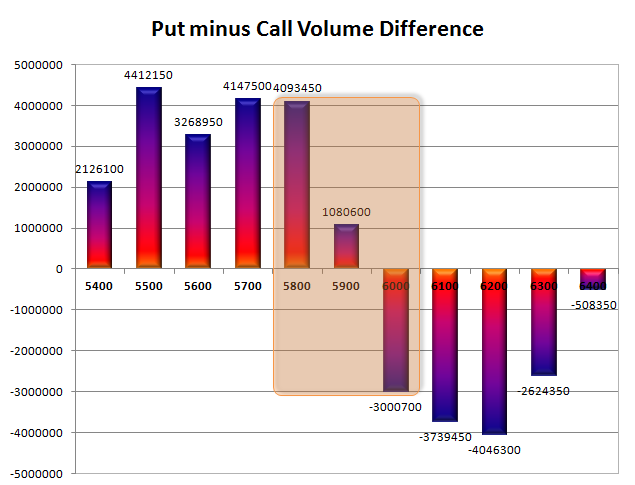 Range as per Option Table is 5851 -5936 and as per VIX is 5843 - 5933 with 5900 as the Pivot.